43Things a place you can share your goals and hope! Today as I didn’t have any classes I had time to find another new social media platform which is “43 things”. If you haven’t heard about it hear is a brief information. Different common things bind us to others in our various social circles. Family relations, friendship ties or professional collaborations are examples of such connections we have to different clusters of people. A quick look on these connections show that nearly all of them are based on who we are now. But can we connect to people based on what we want to be? In other words, can what binds us to others be not based on our current position, but based on where we want to be in future? Can we form a social circle with whom we share nothing but a goal? Yes, “43Things” is the virtual society where goals are the basis of your identity and your connections. 43Things was launched in 2005 and has more than 3,000,000 users now. People share their goals or hopes and find others who hope for the same things and go towards the same goals. Technically, this happens through categorization of goals by folksonomy and users whose goals fall in the same category get connected. The platform has a motivational function and users share your progress, talk about the outcomes, give and get advice, cheer others on their achievements. On its first page, 43Things lists a number of goals people have shared. A quick look on the list shows you do not need to have lofty or philanthropic goals, even “eat Mexican food” counts! According to 43Things website, the most popular goal is “to lose weight” (41822 people) followed by “write a book” (31198) and “stop procrastinating” (30386)! Busuu, Learn, Teach and Socialize! Developers of new social media platforms, should be smart in identification and actualization of social media potential benefits. In other words we should look for what social media offers superior to a regular webpage and exploit that special capacity. I like those platforms that use those unique capacities of social media to achieve goals otherwise not readily achievable. Busuu is an example of such platforms. One of social media main features is connecting users of various backgrounds. Busuu, benefits from this feature to facilitate learning twelve different languages directly from native speakers! Busuu was started in 2008, UNESCO international year of languages. It expanded rapidly since then and now has more than 12,000,000 users who help each other learn English, Spanish, French, German, Italian, Portuguese (Brazil), Russian, Polish, Turkish, Arabic, Japanese, or Chinese. Busuu offers structured courses in different levels. By completing courses and passing the tests, you earn points (e.g. Busuu berries!) and go to the next level. However, not all features are for free. To benefit from more sophisticated educational tools such as. video units, voice recording, and podcasts you need to upgrade to the paid version. Users are both teachers and students: one teaches her own language and learns from others. In this way users can learn other languages directly from native speakers. For example you can submit your writings for correction or chat with others. To test the system, I submitted a short writing in Arabic and got two feedback in less than a minute! One feedback was just saying “good”. But the other one was a very detailed correction. Both of comments were from native speakers (one from Algeria and one from Jordan). Do you think social media is just for the laymen? Well, if you think so, you are wrong! I was talking with my husband, Hamed about various uses of social media I had recently learnt about. Surprisingly I found out he is a heavy user of one such platform as part of his daily research on computational biology. Scientists, the most unsociable species on earth now have gone social! Why do computational biologists need a social network of their own? The answer is hidden in the nature of their work. Scientists care about things that no one else outside of their community cares about. They have questions that no one can answer. What they should do? Do they have to wait till they go to a conference and ask their questions from each other? No, they are way smarter than that; they have formed their own social media. There are several examples of such social networks. They usually form around a central software heavily used for various research purposes. Communications happen via forums. 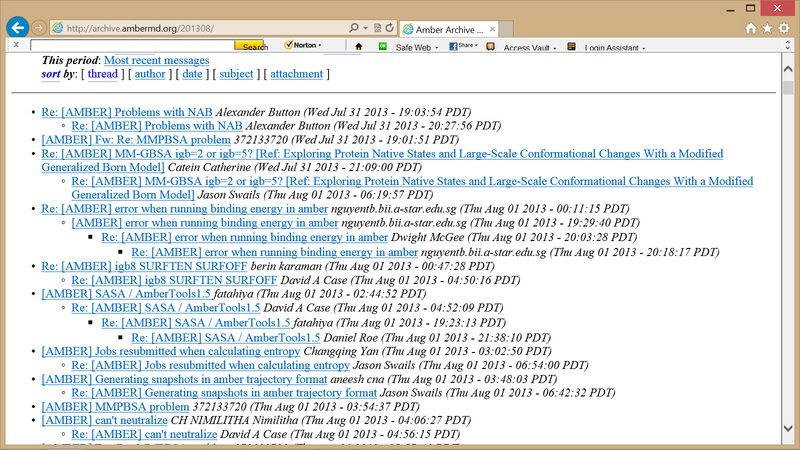 The snapshot below shows one of these platforms formed for AMBER users. 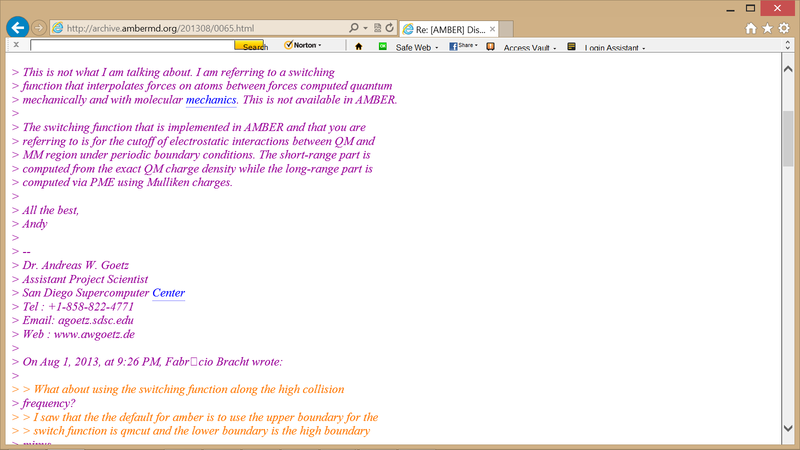 AMBER is a biomolecular simulation package (don’t ask me what that means!) As you see, the design is awful! No pictures at all! In fact the design perfectly reflects the psychology and aesthetic views of the users! Clients mostly use their real identities. Hamed knows a few of these names who are reputable scientists. An answer from the “giants” will be considered the final answer. As you know reputation is everything for a scientist and Hamed believes disclosing real identities put a pressure on people to give more careful and accurate answers. Some users go further and include even their phone number in their answers as you can see in following snapshot. This much disclosure of identity shows users consider this virtual society a safe environment. They try to expand their professional network by telling who they are and showing off how good they are in what they do. It is interesting to go into depth and analyze the sociological structure and communication culture of such societies. Can we identify behavioral differences between specialized societies representing experts of different fields? For example will the social culture of a platform for mathematicians differ from the social culture of a platform for social sciences? It is fun to know the answer. People have argued that social networking sites and social network platforms are different. On social networking sites people tend to visit new people and find new friends. On the contrary, social networks mostly reflect one’s actual network of friends and acquaintances in real life. Considering this fact, it is not surprising that various geographic regions are represented differently on different social networks. In fact when someone from a certain real society joins a virtual society, there is a higher chance that others from that real society join that particular platform. In short the more members of a real community join a particular platform, the higher the chance others from that community would join it. Cloob is a social network sites for connecting Iranians. Launched in 2004, now it has more than a million users and enjoys more than 100 million page views per month. This platform offers common features of social network sites e.g. content sharing and friend lists. It also facilitates discussions in larger scales by supporting communities and community discussions and question and answer forums. Cloob has a virtual currency called “coroob” and an income/expense book keeping service. Users can spend this money on virtual shops offering a wide variety of virtual and real goods. This money can be transferred and transacted between users. One can guess that the culture of local virtual societies is a reflection of the real society they represent. Cloob is not an exception to this rule. In fact designers of this site intentionally “Iranize” the environment. This make the virtual environment seem more friendly and familiar to its target audience. Not surprisingly, with just a quick look at the website one can find ads promoting goods especially for Iranians. Live a Second Life, this time in your fantasies! We recently read a few papers on self-expression on social media platforms. We discussed that discrepancies between one’s real identity and the identity she expresses in social media is one of the points of focus in this area. Usually people tend to present an idealized version of themselves in such platforms and try to show not the self they are but the one they want to be. Various platforms use different techniques to reduce this dissimilarity and make users’ profiles more realistic. But in this post I want to introduce a social media platform with a 180 degree different approach: you can be as unrealistic as you want! This approach goes to the extreme ends of even not being a human, but an animal or a fantasy creature! “Second Life” is a unique social media platform in which users live and interact in a virtual world. This world is built and managed mostly by the users. People represent themselves by adopting any “avatar” they want. These avatars can resemble their real life identities, or can be anything from a fantasy creature with horns and wings to animals and even plants and objects! Not only the avatar but also the social characteristics of people (e.g. their occupation or residence ) are designed by themselves. You can interact with other users in public areas or go to their private places and make your circle of friends and contacts. This virtual society has its own currency Linden Dollar L$ which can be exchange for real dollars! In fact you can earn money in this virtual Second Life and spend it in your real first life (see this Wikipedia page). Usually people do not earn huge money but there are some who do e.g. Ailin Graef (Anshe Chung in Second Life) who earns more than 1million dollars per year by selling only virtual goods! According to unofficial postings on Second Life website (this link) there are 50,000 to 60,000 users living in this virtual world at any moment! This large number reminds us of the powerful tendency to be the character ones desires, even if in a virtual world. This tendency takes other forms in more realistic and serious social platforms. This fact should always be considered in deriving any conclusion from analyzing virtual social practices. Behavioral studies specifically targeted to analyze virtual behaviors and their correlation with real social behaviors can provide us with the necessary insight. While Dorsey refers to the social media being filtered in Iran, I want to look at his question from a different perspective. I want to reword his question: “Good evening, President. Will citizens of Iran read your tweets?” and the answer is probably “No!”. Twitter is not generally popular among Iranians and filtered or not, citizens of Iran will not read his tweets save those reflected in news. 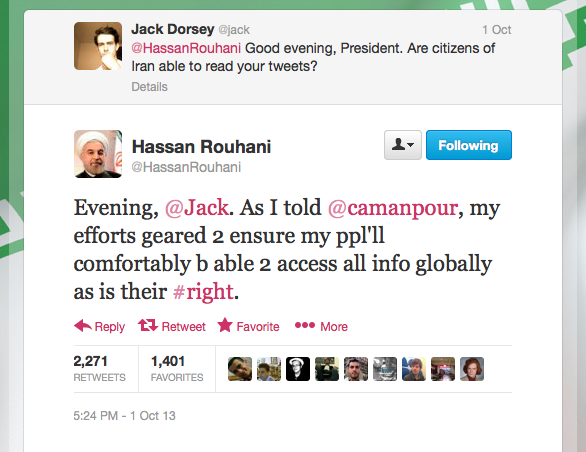 So why Rouhani posts on a platform which neither is open to Iranians, nor is popular among them? I believe he does not post on Twitter for Iranians. His target audience is beyond Iran’s borders where Twitter is highly read. This is why, I believe, that his posts are in English not Farsi. At the same time Rouhani uses Facebook to communicate with his domestic audience and you see that all of his posts are in Farsi. In general different social media platforms are used for different goals based on their technical and social properties. For example celebrities mostly post their photos on Facebook or Instagram while they use tweeter to share news. Different uses based on technical differences are more or less obvious, e.g. especial tools for sharing photos on Instagram. But how social features of each platform affect how the platform is used? What factors determine social features and how they evolve over time? I believe these questions are fundamental for a correct understanding of dynamics of social media.